Postponed twice after its initial theatrical release date (which is never a good sign), Lucky You is worth a look simply for the talent roster comprised of L.A. Confidential director Curtis Hanson who co-wrote a script with Forrest Gump and The Horse Whisperer scribe Eric Roth, and cast Munich’s Eric Bana, alongside Robert Duvall and Drew Barrymore. Proving there is such a thing as too much talent, this beautifully photographed and crisply edited work never fails to engage us beyond much of a casual interest and ultimately disappoints in its story of a gambler who must (as is the recurring character theme of most of Hanson’s oeuvre) change the direction his life is headed and rectify his personal issues. Set in the fake, smoky, brightly lit casinos of Las Vegas, we first meet Huck Cheever (the gorgeous Bana) as he pawns a few items in a seedy shop, managing to talk the woman behind the counter into giving him the most money for each for his quest to return back to the tables, first battling the guppies until getting into the high stakes waters with the sharks, including his main Achilles heel-- namely Huck's father L.C. (Robert Duvall). Duvall makes the most out of his underwritten role as an English professor who was a perpetual disappointment to Huck and his mother growing up but whose love of gambling and playing for pennies, nickels and dimes on the kitchen table spread into a compulsive need in his now-grown son who still harbors some major father issues that would even make quintessential James Dean inspired characters wince, although admittedly the audience may be more readily accepting of his preoccupation if we were given more than just the slightest hint of a few lingering arguments and events. L.C.’s career as an English professor is barely mentioned but literature majors and those who love books will immediately begin to draw some parallels between the intriguing name of Huck and the last name of Cheever with some parts of the storyline. 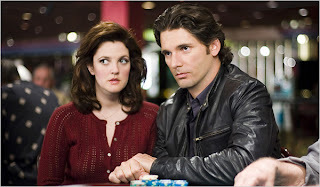 Set during the World Series of Poker in 2003 as Huck tries to get a seat and nearly secures one twice save for bad luck with a dealer and vanity with his father, he’s also given romantic complications by having the “offer” of a love interest in the form of the thankless character of Billie Offer (Drew Barrymore who is given a tongue-in-cheek name as well), a Bakersfield California native who comes to Vegas to stay with sister Debra Messing and become a crooner. Quicker than you can say “know when to fold ‘em,” Huck manages to lose Billie’s money and finds that she isn’t as interested in a love triangle especially when competing with the man’s father and while the female character in a poker film is almost always forgettable and thankless, the one benefit that Billie “offers” is not being a stereotypical tart or showgirl. The maddening film has all of the elements of great storytelling and comes close to hooking us several times but unlike Huck’s weakness with his father, the major Achilles heel for Lucky You is the overly technical poker terminology utilized throughout the film. For those of us who barely understand more than a few of the basic principles of poker, there are literally chunks of time that are wasted with in-depth analysis of various hands and percentages—all of which we keep thinking may help illuminate the goings-on better than the dialogue but which are a complete loss to most audience members looking for a worthwhile story instead of a doctoral level dissertation on the intricacies of poker. All in all, a forgettable film of Hanson's and fans of his movies should stick with Wonder Boys and In Her Shoes for similarly themed but superior work.